Did someone call for a hero? I think they did! The hero in question is one Snow Villiers, Serah’s fiance and soulmate. They’re actual sweethearts who indulge in spin hugs and logo inspired jewelry because who needs engagement rings. Snow has a thickheaded chivalry to him - he’ll charge in guns blazing and somehow, everything works out - yet he’s well deserving of his self proclaimed heroic title. He’s that selfless, warmhearted idiot with belief and optimism to spare, the kind that manage to worm their way into reluctant sister-in-law’s hearts, so Lightning at the very least tolerates him blundering from one objective to the next. On first glance, it would be easy to identify Serah and Snow as opposites, and yes, opposites attract. But beneath that surface, the two of them are actually very much alike - it’s those similar qualities that inspire the other on, that bring out the best of the rest. Serah and Snow are equally stubborn, equally selfless, and equally kind individuals... and Serah has done plenty of seemingly crazy, Snowesque things in her time. See: screaming at Hope about a Proto fal’Cie, charging down a killer flan without her weapon to defend her six-foot-something fiance who can (unlike her) punch things to death, walking into a totally-not-Pulsian Vestige and getting branded as a l’Cie… the list goes on. Also, their love endures, no matter what. Their song is called ‘Eternal Love’ for a reason. Through the many countless hardships and the strain of time apart, Snow’s connection to Serah, and vice versa, remains entirely unconditional. For Snow as well as Lightning, their motivation is always Serah - Serah’s heart might be split between them, and focused more on Lightning because she is the person lost and the one she’s without - but for Snow, Serah is everything. Every action Snow takes is either for, or about, Serah. There isn’t any inbetween. And the difference between Snow and Lightning? Snow believes in Serah, without question, right from the start. His optimism stems from Serah, and when the rest of the party do come around to Snow’s idealism, they begin to believe in her too. When Serah tries to shut Snow out, tries to hurt him in order to protect him, Snow persists. He realises there’s something bigger going on, and they’ve come too far to simply quit - and with his acceptance, Serah reveals that she’s a l’Cie. Snow can’t believe this because like the rest of his party he’s been conditioned to see l’Cie as monsters, but his struggle is different. He starts off defeated, wondering how he feels about that - like Lightning prioritises - but wait. What about Serah? How does Serah feel? She’s alone, vulnerable, isolated… and for Snow, Serah’s happiness is the utmost importance. Snow constantly places himself beneath the rest of the cast because he compulsively needs to protect and save everyone, damn the consequences, damn himself. 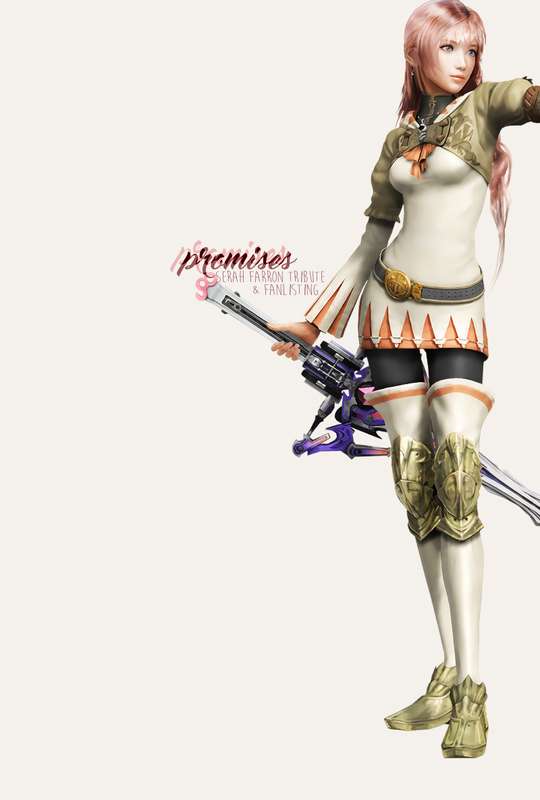 His effective family is extended this protection, and Serah gets it the most. He aligns himself to a l’Cie, and that’s a very, very big thing - and he makes sure she knows he’s always by her, all the way, by asking her to marry him. It’s always, always about Serah. It’s not the last time he does it either. When Lightning seemingly disappears from time, Snow spends the next two years watching Serah’s soul slowly die. All the evidence points towards Lightning being in the pillar, but just as before, Snow believes Serah anyway. He can’t watch her suffer, so he goes to fix it. He has no plan, no direction, no means to achieve it, but no matter what, Snow intends to fix it. Someone has to do something, and Snow is often the first person to decide that it’s going to be him. The thing is, Snow leaving near kills Serah entirely. With Lightning missing, she takes priority. Serah’s journey is about finding her sister. Her most important beats are in that journey she takes in XIII-2, and so much of it is Lightning centred - it’s why I’m going to such great lengths to talk about Snow because while it’s not her journey, Snow is a part of Serah’s story, her world. He’s no less important to her: Snow merely takes a backseat because there is no conflict, no resolution, only the fact that she needs him because he has such unconditional faith in her, always. In Sunleth, Serah gets Snow back and then loses him straightaway and that’s a crippling blow to her heart, because Serah can’t be happy with one missing and without either of them, she wilts with grief. She becomes almost comfortable with that terrible loneliness back in New Bodhum. That’s what Noel recognises and where his accusation of thoughtlessness to consequences stems from - because Snow’s left Serah behind without seemingly a care. As it is, Snow does know what he did and continues to do, but as with all hero types, he’s incapable of stopping - and Serah can never truly be happy without Lightning. Leaving to find her was the lesser of two evils. He’ll fix it and make it right. It’s what he does. You can’t not fight for the people you love. It’s a lesson Serah has learned from them both. When Serah does get to journey through time, Snow is incredibly proud of her. When Serah makes up her mind to come and get him if they’re apart for too long, he smiles. ‘That’s my girl’. It’s his belief, his trust, coming into play again - Serah will find a way to bring everyone together again, if that option is denied to him. But she doesn’t. Instead, Serah dies: and Snow, as the player knows him, is gone for good. Serah haunts the entire cast but it’s Snow that changes. For him, it’s not a part of his world. Serah was his entire world and without her, it destroys him - it’s awful and yet it’s so masterfully done. Snow’s character arc is the reverse of the rest of the cast - whereas they enter the saga incomplete, unhappy and closed off and at their lowest point, Snow doesn’t. He stands resolute from day one with only flickering moments of doubt, but when Serah dies… Snow gives up. It’s a slow destruction. It’s slow, because of course he tries. The man who was so adamant about completing a Focus and saving Cocoon? The man who never gave up, no matter the odds? Gone. This man wants to die so he can be with Serah. So he can forget. This one wants to become a cie’th so his torment can be ended. Snow’s love for Serah never lessens; he never gets over Serah, and that’s what tortures his soul. Without her, Snow dies. One of Lightning’s few emotional points in Lightning Returns? When she’s trying to get through to a grief stricken Snow turned c’ieth. It’s the first time since her awakening that she’s allowed herself to mourn. And she gets through to Snow. There’s enough hope, enough love, left in him for one more shot in getting Serah back. And they do. And Rems cried a lot, and is forever cynical about her lack of a wedding because dear lord do they deserve one in rural France surrounded by fifty children, most of them adopted. I have a lot of feelings about Serah and Snow, as you might have noticed.